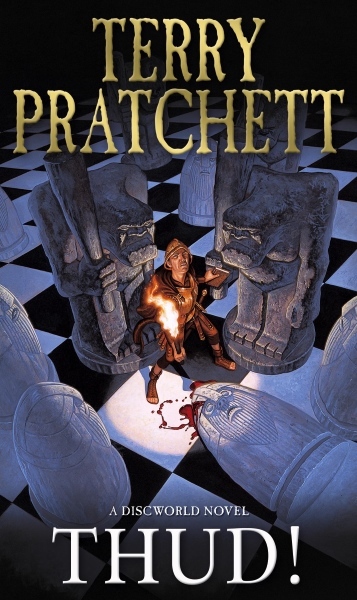 : Home Books Discworld Thud! THUD! Koom Valley? That was where the trolls ambushed the dwarves, or the dwarves ambushed the trolls. It was far away. It was a long time ago. But if he doesn't solve the murder of just one dwarf, Commander Sam Vimes of Ankh-Morpork City Watch is going to see the battle fought again, right outside his office. With his beloved Watch crumbling around him and war-drums sounding, he must unravel every clue, outwit every assassin and brave any darkness to find the solution. And darkness is following him.